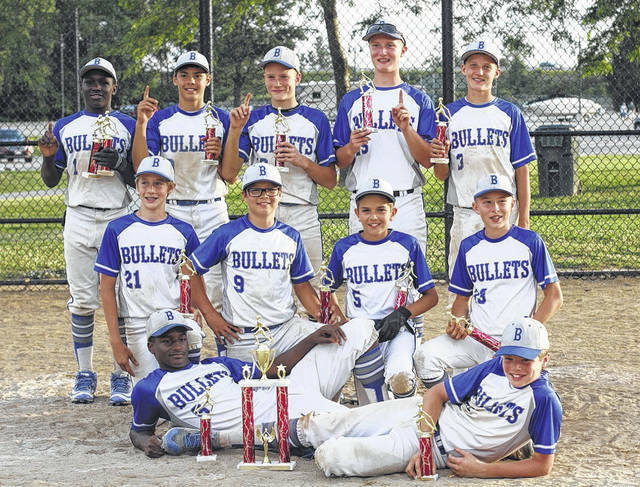 The 13-U Mid-Ohio Bullets wrapped up their season by winning the championship at the Castalia Duck Pond Classic, going 5-0 and finishing their season with a 16-9-2 record. They beat Buckeye Knights 14-4, Ohio Perry Dawgs 12-6, Ohio Vipers 22-6, Bay Area Bombers 6-2 and Amherst Steelmen 6-5 in nine innings. Pictured are, back row (l-r): Max Lower (Northmor), Sam Seidel (South Central), Blaine Bowman (Shelby), Luke Shepherd (Shelby) and Marshall Shepherd (Shelby). Middle row: Caden Eichler (Lexington), Marcus Cortez (Northmor), Isaac Blair (South Central) and Griffin Workman (Northmor). Front row: Pierce Lower (Northmor) and Jeremy Holloway (Shelby).